BATTLE IN BAKO: Tonight marks the seventh of eight meetings with the Condors this season, and the third of four scheduled visits to Bakersfield’s Rabobank Arena. The Roadrunners are playing the first of a three-game road trip; they’re coming off of a 4-3 loss to the Texas Stars on Saturday night. The Condors are playing the third of a four-game home stand; they’re coming off of a 3-2 overtime win over the San Diego Gulls on Saturday. TOP TO BOTTOM: The Pacific Division has been, and remains extremely tight in the standings department. Only 12 points separate the top team, Tucson, from the bottom team, Bakersfield. The Roadrunners, 5-1-0-0 against the Condors this season, will look to add a little distance from the division’s basement with a win tonight. CONDOR KILLER: Dylan Strome has 15 points (6G, 9A) in six games played against the Condors this season. He has registered multiple points in four of those games. 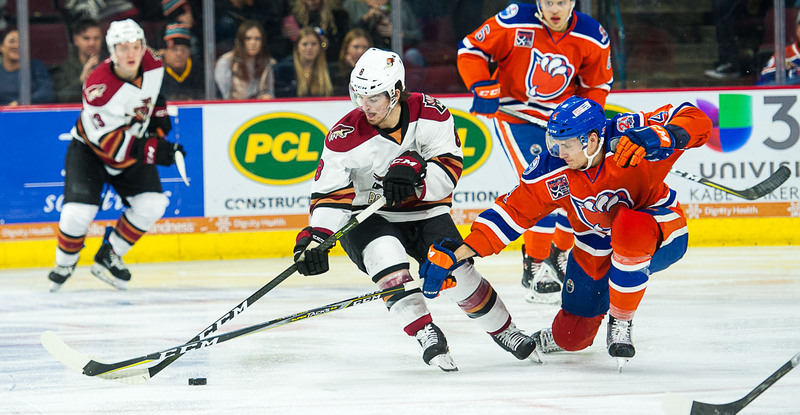 Strome netted the game-winning overtime goal on December 29 at Rabobank Arena, securing a Roadrunners 5-4 victory over the Condors. The rookie forward enters the night with two goals in his last four games, and a total of 49 points on the season. 100 FOR KEVIN: If he should be in the lineup tonight, Kevin Ekman-Larsson will be playing in his 100th career professional game. Ekman-Larsson appeared in a combined 80 games with Tingsryds AIF of the Allsvenskan the previous two seasons, accumulating a total of 11 points (2G, 9A), and has played in 19 games with the Roadrunners to date. 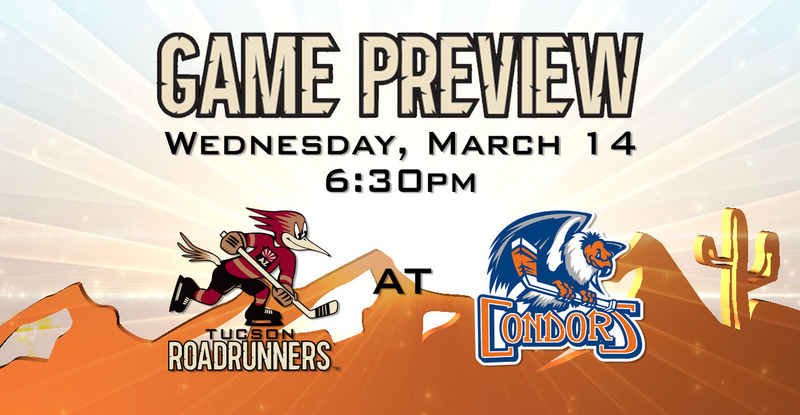 THE LAST TIME AROUND: In the teams’ previous meeting on February 19 at Tucson Arena, the Roadrunners fell to the Condors by a 3-2 score. After falling behind by three, Dylan Strome and Tye McGinn netted third period goals to get the Roadrunners back to within one. Hunter Miska stopped 14 of the 17 shots he faced in the loss. THE CARTER: With three points (1G, 2A) registered during the Roadrunners’ series against the Texas Stars, Carter Camper now has 50 (14G, 36A) on the season. Camper currently ranks ninth in the AHL in scoring, and has had a hand in eight of the 12 Roadrunners goals scored since making his team debut on March 2. He buried his first goal in a Tucson uniform Friday night at Tucson Arena. PLAYOFF PUSH: The Roadrunners enter the evening having the third-lowest magic number (24) in the Western Conference. The Condors, who sit in last-place in the Pacific Division but only eight points out of the fourth and final playoff spot, are theoretically in ‘must-win’ mode.